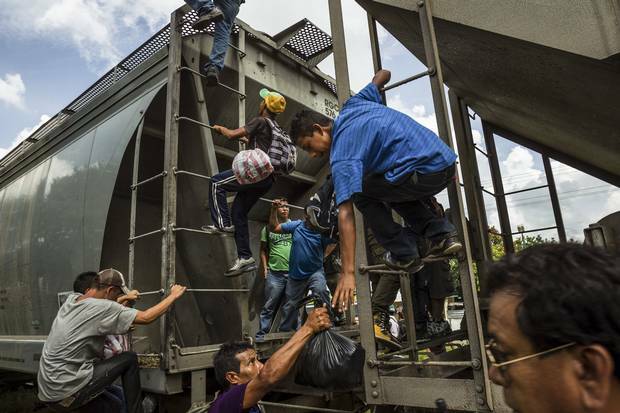 Migrants ran and climbed aboard a northbound freight train known as “The Beast” as it passed through Tenosique, Mexico, earlier this month. Critics of the plan were quick to pounce, saying it appeared to redefine the legal definition of a refugee and would only increase the flow of migration to the United States. By moving decisions on refugee claims to Honduras, the plan is aimed at slowing the rush of minors crossing into the United States illegally from El Salvador, Honduras and Guatemala, which has overwhelmed the Southwest U.S. border this year. More than 45,000 unaccompanied minors from those three nations have arrived since Oct. 1, straining federal resources to the point that some agencies will exhaust their budgets by next month, the secretary of Homeland Security has said. Administration officials confirmed that they are considering the idea, although they stressed that no decision has been made to move forward. They said the idea is one of many being discussed by officials at the White House and the Departments of State, Homeland Security, Justice, and Health and Human Services. Among the factors surrounding the decision are how many people in Honduras would be eligible to apply for the program and how many would likely be approved. The proposal, prepared by several federal agencies, says the pilot program under consideration would cost up to $47 million over two years, assuming 5,000 applied and about 1,750 people were accepted. If successful, it would be adopted in Guatemala and El Salvador, as well. Children would be interviewed by U.S. immigration employees trained to deal with minors, and a resettlement center would be set up in the Honduran capital, Tegucigalpa, with assistance from international organizations like the International Organization for Migration. The plan would be similar to a recent bill introduced by U.S. Sens. John McCain and Jeff Flake of Arizona, who proposed increasing the number of refugee visas to the three Central American countries by 5,000 each. According to the draft, the administration is considering opening the program to people under 21. It also suggested offering entry on emergency humanitarian grounds — known as humanitarian parole — to some of the applicants who did not qualify for refugee status. That would likely cause an outcry among critics who believe that President Barack Obama has been too soft on immigration. But officials called it “highly unlikely” for people who were denied refugee status to be considered for parole, which is generally offered in isolated instances for emergencies. Mark Krikorian, the executive director of the Center for Immigration Studies, which supports tighter controls on immigration, argued that the proposal would increase, not stem, the flood of migrants from Central America trying to get into the United States. The preliminary plan could create a thorny challenge for the administration because the definition of a refugee is legally specific, and children fleeing street gangs could have a hard time qualifying. Under U.S. law, refugees are people fleeing their country of origin based on fears of persecution by reason of race, religion, nationality, political opinion or membership in a particular social group. The draft of the plan noted that 64.7 percent of the unaccompanied minors who applied for asylum this year got it, which suggests that immigration officials have found their claims of imminent danger credible. With that in mind, the draft proposal suggested that 35 to 50 percent of the applicants in Honduras could be considered for relief, a figure the White House said was inflated. The early draft, the White House said, was the most generous and least likely of the options the administration is considering. How many people are accepted is critical because refugees qualify for public assistance upon arrival in the United States. Under McCain’s proposal, refugees would be processed at home, and those arriving in the United States illegally could be deported quickly. Kevin Appleby, director of Migration and Refugee Services at the United States Conference of Catholic Bishops, said the plan would be welcome, as long as it does not substitute for protections Central American children currently receive under American law. When a similar plan was adopted in Haiti, as a way to keep people from taking to the high seas, he said, it was ultimately criticized because Haitians already in the United States did not receive help. “It ended up being counterproductive to the goal,” Appleby said. Stacie Blake, the director of government relations for the U.S. Committee for Refugees and Immigrants, an advocacy group, said the processing of potential refugees in Central America could be handled by the U.S. government or by the United Nations, which makes refugee determinations in many other countries. She said some of the people designated as refugees in Honduras could end up in countries other than the United States. On Friday, Obama is scheduled to meet with the presidents of Honduras, Guatemala and El Salvador at the White House in an effort to urge the Central American leaders to do more to help stem the flow of children fleeing their countries for the United States. Great but our President will probably grant refugee status to all those who are here. Unbelievable.